Shoppers Drug Mart has a new contest! 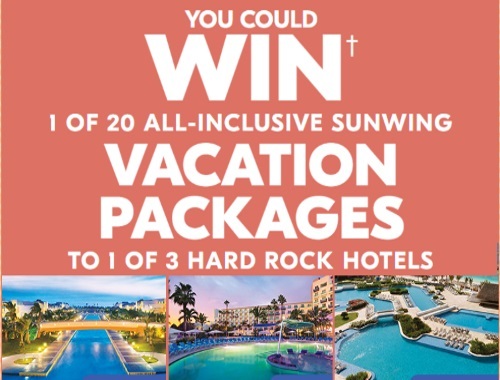 Enter to win 1 of 20 all-inclusive Sunwing Vacation packages to 1 of 3 Hard Rock Hotels! Win a trip to Punta Cana, Vallarta or Riviera Maya. Contest cards are given out in-store until November 3 or while quantiites last to Shoppers Optimum cardholders who purchase $5 or more of eligible products before taxes. Contest closes November 23, 2017.